“When It’s Never About You” by Ilene S. Cohen, PhD. is an inspirational, to-the-point guide to help readers take back their lives from being a habitual “people pleaser,” those often feeling invalidated, ignored or disrespected by family, friends or co-workers. For those of us who have spent an enormous amount of time trying to make others happy, solve their problems or take on their issues, we have forgotten who we are and how we want to live our lives. For me personally, it is a tiring, stressful, depressing life to live. Many of us say we are going to change and let others be responsible for themselves only to fall back into the same pattern. I appreciated the reinforcement “change isn’t easy,” and it will take sincere desire to make these changes regardless if others get angry, or cut ties with you. Cohen makes an excellent point on page 3, “It’s easy for people-pleasers to give others control of their lives, only to later wonder why they’re always dissatisfied, depleted, and surrounded by demanding people.” Regarding the term demanding, it can come in the form of passive-aggressive behavior or helplessness by others. The author gives two great terms to readers, “self-full” which is being in relationships without losing yourself and “self-fullness” which says one is only responsible for themselves. Utilizing the Bowen Theory and her common sense approach, Cohen provides readers with activities at the end of numerous chapters as well as an appendix of further reading sources. One area that piqued my interest is about feeling like we need to be in relationships to complete us. The media, society and friends all give the impression if we aren’t in a committed relationship we are not a whole person. Based on this, many end up with someone who is dependent on us to make decisions for them or solve their problems. 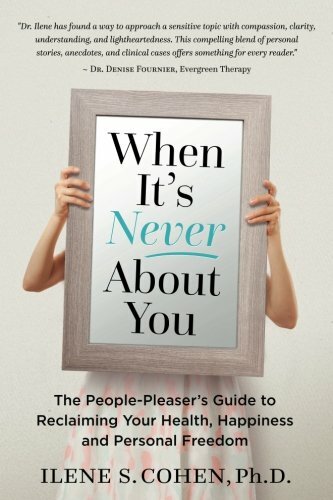 I am truly impressed by “When It’s Never about You” by Ilene S. Cohen, PhD., in that she doesn’t chastise those of us who are people-pleasers, but gives support and guidance on how to make positive changes. I would highly recommend this book to everyone, including those who are in the professional field.